The 40.8 metre motor yacht Scorpion 2, listed for sale by Richard Higgins and Adam-Michael Papadakis at Camper & Nicholsons, has been sold by the yard. 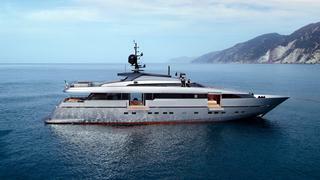 Built in aluminium by Italian yard Sanlorenzo, she was launched in June 2011 as hull No. 6 of the Alloy 40 series designed by Francesco Paszkowski. Built to ABS class, _Scorpion 2 _is powered by twin 2,340kW MTU engines giving a top speed of 28 knots and a cruising speed of 26 knots. Accommodation is for 10 guests in five cabins plus six crew. MCA compliant, guest accommodation consists of a main deck master suite, a VIP suite, a double and two twins, all with entertainment systems, television screens and full en suite facilities. The large and comfortable saloon has a relaxation area in front of a full entertainment centre including a 55 inch Sony LED television screen, Blu-ray DVD and surround sound cinema quality loudspeakers, and there is a formal dining area forward. Special features include sea terraces in the main deck master suite and the main saloon, zero speed stabilisers, gullwing doors to the wheelhouse, and she is the only yacht in this series to have a Jacuzzi tub on her upper deck. Scorpion 2 was asking €11.5 million.